What other local icon is closer to the hearts and minds of Melbournians than its trams? 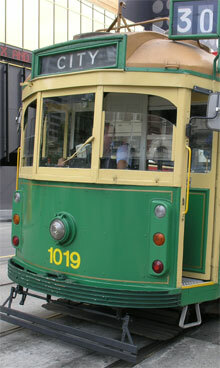 Unlike Australia's other capital cities Melbourne fought to maintain its tramways system after World War II. But by 1999 Melbourne's tram conductors were starting to be phased out in favour of electronic ticketing machines on trams. I am delighted to announce in response to public demand, and to celebrate the tenth anniversary of its original release on VHS, Tram People Down Under has at last been digitally re-edited and restored from its original analogue master tapes. With new digital titles and updated soundtrack it's now back for viewing on DVD. Tram People Down Under was originally released as a 165-minute three-part video documentary on VHS video entitled "Tram People" in 1999. It was intended to be a tribute to the unsung heroes of Melbourne's tramway system. Apart from being huge a nostalgia trip it seems to have become an historical document as well! Please note: I wish to thank Melbourne's tram people for allowing me to record video interviews with them in 1999 and for giving me permission to utilise their stills and video footage in this production. Written and Produced by Paul Norris. Original VHS video release © 1999/ DVD version © 2010. All Rights Reserved. Exempt from Classification. It is an interesting addendum that copies of the master tapes of Tram People Down Under have now been preserved and are held for posterity by the National Film and Sound Archive in Canberra. I would like to acknowledge and thank the staff at the NSFA for their work. - P.N. A special six-part "Tram People Down Under"
TV Channel 31 April-May 2010. 3AW's "Nightline" (AM 693) Sunday April 11th, 2010. Disc #1 - Part One: Global Tramming. Disc #2 - Part Two: Staying on Track. Disc #3- Part Three: Tram Culture. Total Running Time: Approx 160 minutes.